Some Conservative colleagues argue vehemently against the introduction of proportional representation for elections to the House of Commons but support an elected second chamber. I point out to them that there is an inherent inconsistency in their argument. The fundamental argument against the use of PR for parliamentary elections is that it would destroy the core accountability at the heart of our political system. Our existing electoral system facilitates, but does not guarantee, the return of a single party to government. There is thus one body – the party in government – elected through elections to the House of Commons that is responsible for public policy. It has stood for election on a particular platform, against which it can be judged, and – most importantly of all – it can swept from office at the next election. Knowing that, it tends to be responsive to public opinion. As Popper recognised, the current electoral system is central to ensuring that a government can be removed, cleanly and peacefully. There is no divided accountability, no potential for buck passing, no blurring in the eyes of electors as to who is responsible for what. Others may favour such blurring: the distinguished political scientist, Giovanni Sartori, argued for coalition government precisely because it makes it difficult for electors to ‘pin down who is responsible for decisions’. Conservatives, however, support a system where the line of accountability to electors is clear. This was one of the central arguments advanced in 1998 in response to the Jenkins Commission report on the electoral system. In large part, the other arguments flowed from this core point. I can say that with some confidence, as I penned the response. The core accountability of the present system derives not only from the existence of the first-past-the-post electoral system but also the existence of asymmetrical bicameralism. There is one elected chamber, through which the government is elected and through which it is accountable to the electors. We have the benefit of a second chamber but without the divided accountability that would derive from having a second elected chamber. 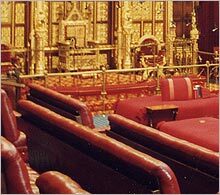 The House of Lords adds value to the political process by carrying out tasks that complement those of the elected chamber. It does not seek to challenge the electoral supremacy of the House of Commons. It can invite the Commons to think again, but ultimately the Commons is entitled to gets its way. If the second chamber was to be elected, it would be in a position to demand more powers than the existing House. It may not be co-equal to the first chamber but it would likely demand more powers than the existing House and be willing to exercise those powers. Election would change the terms of trade between the two chambers. There would be no reason why elected members of the second chamber would see the role of the chamber as a complementary one. There would be the potential for conflict between the two. This could lead to stalemate or more often to deals being struck. Such deals would be more likely to be to the benefit of parties and special interests than to the benefit of electors. There would be no clear line of accountability for what emerged or, indeed, what failed to emerge. There are those who, quite legitimately, do favour divided accountability. They have a valid argument. It is not one I agree with, but I recognise it as an argument I have to counter. My point here is not with those who develop such an argument. My concern here is with those who defend the FPTP electoral system on grounds of core accountability but then argue for an elected second chamber. If you believe in having a political system where there is a clear line of accountability between government and electors, then one needs to defend both the existing electoral system and an appointed second chamber. This entry was posted in Uncategorized and tagged accountability, electoral reform, first past the post electoral system, Karl Popper, Lords reform, proportional representation. Bookmark the permalink. Do you have amy examples of this? After all, barring such issues relating to the parties themselves, all parties goals should be applying what they think is best for the country. Also, Lord Norton, are you happy with the current system where the ruling party has large choice on who is appointed to the second house? As I pointed out earlier, and is happening with the Lib-dem Conservative goverment, and almost happened back in 1910(ish) large amounts of ‘sheep’ peers can quickly be appointed, decreasing the ability of the second house to acts as a check on the 1st house. James Walker: The USA is a very good example. The work of Hibbing and Theiss-Morse shows that there is little correlation between what Americans want and what Congress produces. I want to change the system by which members of the second chamber are appointed. For a start, the Appointments Commission needs to be put on a statutory basis. This is one of the provisions of the House of Lords Bill (the Steel Bill) which is likely to be re-introduced in this new session of Parliament. The Commission needs to have power to ensure that all nominees (party nominees as well as its own) meet a high quality threshhold as well as ensure there is a limit on the numbers appointed. Interesting, you make a good case for an unappointed second chamber. However to reduce the association with ‘lazy toffs’, I would recommend radical clear rebranding of the HoL, for example all current members have to reappy, the decisions for the commission are wholly transparent – all reports into selection published on the net, members have tp write blogs/ engage with the public. Possibly some kind of sunset clause where people have to reapply. Obviously this also needs to be completely seperate from the honours system. Commision members themselves may also have to be democratically accountable. Do you have a link to the details of the Steel bill? An elected second chamber is not the answer, yes we need some reformation but papers regarding this have been put forward for years with little actually taking place. There are numerous reasons why an appointed second chamber is far superior to an elected one and I have come to learn that the loose rules regarding attendance are actually a benefit at times. Without the afore mentioned we would lose a great deal of the superb minds and experience we have in the House at present. Yes, there is a degree of flotsam and jetsam that really does need cleaning up and had the House adopted some previous ideaology this would have been done by now, it hasn`t. The call at present from all quarters seems very loud and that is for PR in both Houses but the call at one point was the world was flat by a majority. They were wrong then and are now in my opinion. An appointments commission is the best way ahead, along with limitations on numbers which frankly is becoming absurd but elections no, else we end with a mirror of the commons. Any election would mean it would become purely party representatives as nominees, we would lose experience in many fields. I expect it would follow that they would have to be a dedicated rep in the House, this would rule out most who also juggle other commitments at present. We`d simply end up with professional politicians with no real experience in a field or life for that matter. We also end up with sheep who would follow a party line rather than listen to the public`s concerns and knowledge, politicians simply don`t listen or think when their entire aim is the bidding of a master who COULD limit their climb and success. I am set against an elected chamber but do wonder why the House has been apathetic or should that be lethargic when it has been repeatedly stated that change was necessary. If the House does change to an elected body it would be a travesty BUT it would be no ones fault but the peers who have too long allowed bad habits and a bad system to continue without change. The electorate is baying for blood, the commons has of course offered someone else`s, as is politicians way. The question is are the Lords really so pompous as to fiddle whilst Rome is burning. A referendum on this issue would I believe at present result in an elected chamber, purely through lack of education and perhaps the nonsense idea that getting rid of someone after a period of time, 15 years I`ve heard bandied for elected Lords, would somehow see them as accountable. If this were anywhere near the truth Gordon Brown would now be bankrupt and living in a cardboard box under Westminster Bridge, instead I expect he`ll earn a fortune from his having been a failed PM. Carl.H: Thanks for your comments. There are certainly plenty of us who are far from complacent. The Steel Bill is designed to implement reforms. At the end of the last Parliament, there were also four working groups set up to make recommendations to strengthen the House in fulfilling its various functions (legislative, non-legislative) and these reported just before the end of the Parliament. The sort of proposals were touched upon in the debate I initiated earlier this year on strengthening the House. I also want to see an early completion of a new more transparent scheme of expenses. We`ve seen papers and even Baron Wakeham`s Royal Commission plus much more including all types of votes, little has changed. The commons previously has voted against an elected House as have the Lords…. On 29 January 2003 Tony Blair, the Prime Minister, added his own support to a fully appointed House by arguing against the creation of a hybrid House…. Reform has been promised since 1911, when another Liberal Government…Whoops sorry Clegg isn`t in charge he just appears that way….promised major reforms. I firmly believe the House knows what is necessary but is dragging it`s feet, I am concerned that it maybe dragging them toward the noose. I do think the concept of political complimentarity as you indicate saying the HoL compliments the Commons is at the very heart of what has made British Politics distinct for the las two hundred odd years. Prior to that I would argue that (despite not using the term) it was a balanced mixed government in its ideals as far as classical Greek political analysis goes. While I wish the balance of parts was an ideal I think your Lordship is right to say that loss of a sense of parts complimenting and enhancing a center would utterly change the system. In addition the proposals of change are not likely to reassert tripartite balance and so would not appeal to me. The US was never intended to be the kind of democracy most analysts think it is. Therefore they find it difficult to analyze connections between popular aspirations and legislative results — but that is another matter. I whole heartedly agree with you that FPTP should stay for the House of Commons. Having lived under 18 months with Nick Griffin as one of my MEPs, PR definitely has its disadvantages. I originally thought PR for the House of Commons was a good idea, but over the course of the last month or two, the arguments of yourself and Tom Harris MP have made me change my mind. Indeed some of the problems with FPTP could be solved by other means than electoral reform: ‘Open Primaries’ etc. However, I do believe that an elected bloc of no more than 50% of the seats, chosen by a PR system, would be to the benefit of the House of Lords. Firstly, an incoming government would have no need to flood the House of Lords with new appointed peers. Secondly, by having an election, there is a limited number of seats available to contest, and therefore there is no possibility that the House of Lords will inflate in number, as is threatened by the new government. Additionally, by having this elected bloc, your appointments commission could be even stronger than before: party political appointments could be greatly reduced and more independent minded Peers could be introduced. Further to this, a system of a fixed number of appointed peers could be viably created: due to the constant turnover of elected peers, you could insist that a new peer could be appointed if and only if an existing one has resigned/taken a permanent leave of absence etc. Finally, by ensuring that the elected bloc consists of no more than 50% of the total number of peers, the House of Lords is still less legitimate than the House of Commons and therefore the supremacy of the Commons is not in question. Sorry to repeat the matter (and the link) again, but do you think a system as proposed in an article in the Web Journal of Legal Issues (available here: http://webjcli.ncl.ac.uk/2009/issue4/hand4.html#_Toc240953826) – in short having elections for life peers in a similar manner to the Weatherill hereditaries but with the number per party changing according to, for example, rolling general election results – would “destroy the core accountability at the heart of our political system”? Would such a House be likely to demand significantly more power (particularly given that the set percentage for the cross-benchers – highly valuable people but not ‘democratic’ in some senses – would help reduce the perceived legitimacy)? Any reduction in size may lead to losing some of great minds and experienced people, who may rarely speak, (to whom Carl H. refers above) but a retirement provision (as in the Steel Bill) may have similar consequences. Under this system, a peer may sit out a number of Parliaments but ‘de-retire’ if their peers elected them back in as one of their number should they wish to return after a break. This system would also allow a cap on numbers (such as that envisaged in the Steel Bill), but provide some greater flexibility of appointment (as the Commission would not have to wait for people to retire). The third way is, in reccent years, a much over-used and some may say discredited phrase, but cannot we combine the great benefits of appointment with the perceived benefits of election? Or is it better to fight for pure appointment? only an elected chambers can properly check another elected chamber. Found this whilst researching into Karl Popper. A staunch opponent of PR and inevitably Philosophy collides with Politics once again!